WASHINGTON – The Trump administration is vehemently criticizing former Secretary of State John Kerry after he confirmed this week that he had met with Iranian officials since leaving office. Current Secretary of State Mike Pompeo blasted Kerry on Friday for "actively undermining" U.S. policy on Iran, and, in a tweet Thursday night, President Donald Trump accused Kerry of holding "illegal meetings" with Iranian officials. "John Kerry had illegal meetings with the very hostile Iranian Regime, which can only serve to undercut our great work to the detriment of the American people. He told them to wait out the Trump administration! Was he registered under the Foreign Agents Registration Act? BAD!" the president tweeted. Pompeo said he would leave "legal determinations to others," but said there was "no precedent for this in U.S. history." Josh Rosenstein, a partner with the Washington law firm Sandler Reiff and a specialist in lobbying compliance, told The Associated Press that there are too many unanswered questions to know whether the law applies to Kerry's interactions with Zarif. FARA's provisions don't extend to activities conducted entirely overseas, so where Kerry interacted with him matters. Also unclear is whether any Iranians specifically asked Kerry for advice. "The devil's always in the details," Rosenstein said. "Simply offering advice to a foreign government doesn't make you a foreign agent." Some conservatives have alleged Kerry violated federal law since a May Boston Globe report that he met with Iranian Foreign Minister Javad Zarif in April in an effort to save the agreement on nuclear weapons crafted during his time as secretary of state under former President Barack Obama. After the Globe report, Trump sent a tweet denouncing Kerry's "possibly illegal Shadow Diplomacy." On Wednesday, Kerry said during an interview with Fox News host Dana Perino that he has met with Iranian representatives "two or three" times since Trump took office. Earlier that day, he told conservative radio host Hugh Hewitt he met Zariff "three or four times," but denied "coaching" the Iranian diplomat on the Iran deal. Kerry told Perino he did not meet with the Iranians to discuss the nuclear deal, but rather to talk to them "about their behavior" in Syria, Yemen and in funding Hezbollah. 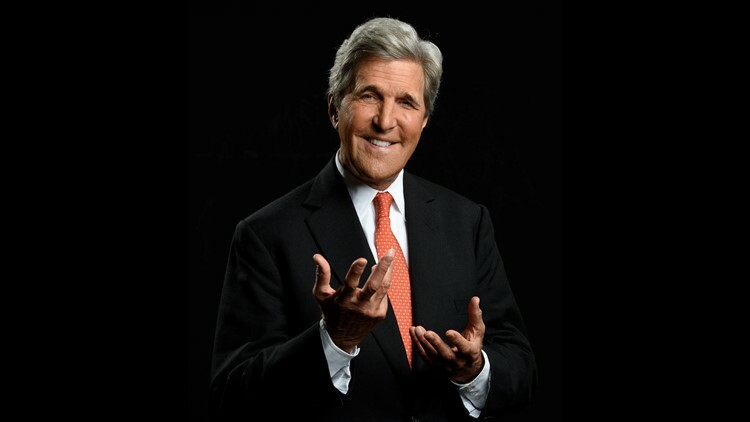 "The Daily Briefing" host then asked Kerry if it was true that he has "been telling Iranians to wait out President Trump and the administration and to wait until there is a Democratic president in 2021." "Well, I think everybody in the world is sitting around talking about waiting out President Trump," Kerry replied. "I mean, you've got our allies remarkably, the people that we have worked with the closest through the years, are sitting there saying, what's next?" Perino said the White House might be unhappy to learn that a former secretary of state was advising Iranians in a way that was "contrary" to the administration's positions. "Secondly, every secretary of state, former secretary of state continues to meet with foreign leaders, goes to security conferences, goes around the world," Kerry explained. "We all do that." "And we have conversations with people about the state of affairs in the world in order to understand them," he continued. "We don't negotiate. We are not involved in interfering with policy. But we certainly have reasonable discussions about nuclear weapons, the world, China, different policies obviously."